The aim of this chapter is to delineate the mechanisms and strategies through which an oligarchy substantiates its power in developed democracies, focusing on Israel. 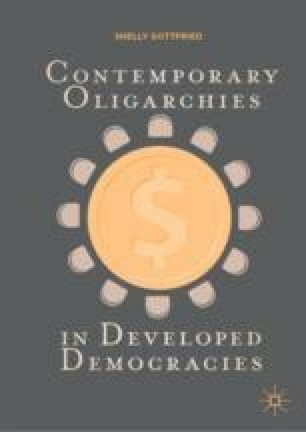 For this purpose, it identifies different forms of oligarchies in democracies, and different strategies they deploy. It delves into the Israeli oligarchy, indicating other cases of oligarchies around the world—particularly the US, South Korea, and Hong Kong. Throughout a long decade, after obtaining significant shares of the privatized assets of the state, and internalizing financialization in the Israeli political economy, a group of very powerful few controlled the Israeli market, influencing policy-making and manipulating regulation for their benefit. They asserted that claims about economic concentration were excessive, and alternatively, that reducing the concentration would push away investors, including themselves. They were advocated as the entrepreneurs developing the free market, in times when they were its rival. Aminadav, G., Bachrach, Y., Kosenko, K., Rosenschein, J. S., & Wilf, Y. (2011). Rebuilding the Great Pyramids: A Method for Identifying Control Relations in Complex Ownership Structures. SSRN [Online]. Available: http://ssrn.com/abstract=1903941. Accessed 30 June 2013. Amit, H. (2007, January 15). The King of Private Raising in 2006: Nochi Dankner Who Raised ILS 4.35 Billion [Hebrew]. Haaretz. Available: http://www.haaretz.co.il/misc/1.1379328. Accessed 2 December 2014. Appelberg, S. (2014, August 5). Hapoalim Bank Tries to Prevent the Exposure of the Documents Which Have Led to the Loans to Nochi Dankner [Hebrew]. TheMarker [Online]. Available: http://www.themarker.com/markets/1.2397531. Accessed 14 September 2014. Appelberg, S., & Rochvarger, M. (2014, April 30). A Compromise: Dankner Will Keep Managing IDB; An External Observer Will Be Appointed; Eyal Gabai Will Have a Position in the Company [Hebrew]. TheMarker. Available: http://www.themarker.com/markets/1.2007852. Accessed 19 March 2015. Avriel, E. (2014, October 10). Israel’s 100 Most Influential: A Force for No Change at All. Haaretz. https://www.haaretz.com/.premium-israels-100-most-influential-1.5313744. Azran, E. (2012, February 8). Sever Plotzker—Centralisation: A Semantic Maneuver with No Content. No Need for a Centralisation Committee [Hebrew]. TheMarker [Online]. Available: http://www.themarker.com/markets/1.1636751. Accessed 20 February 2015. BDI Code. (2012). Ranked Companies. Available: http://www.bdicode.co.il/Ranks_HEB/View/%d7%98%d7%91%d7%9c%d7%90%d7%95%d7%aa%20%d7%94%d7%93%d7%99%d7%a8%d7%95%d7%92. Accessed 5 May 2013. Calcalist. (2011, May 31). A Wedding Thousandth Style: 1500 Arrived to the Wedding Party of Elad Tshuva and Ronny Heyman [Hebrew]. Available: http://www.calcalist.co.il/local/articles/0,7340,L-3519611,00.html. Accessed 13 June 2014. Channel 10 News. (2012, March 6). Why Documents of the State Comptroller on Kadima Party Were Destroyed? [Hebrew]. Available: http://www.nana10.co.il/Article/?ArticleID=881805. Accessed 3 June 2014. Channel 10 News. (2013, January 24). The Article Censored in the Net on Who Determines Which Party Will Rule the State [Hebrew]. Available: http://kalkala-amitit.blogspot.it/2013/01/blog-post_20.html. Accessed 3 June 2014. Dagan, R. (2007, March 19). Arison Called Nehama on Tuesday and Asked: ‘Shlomo, When Do You Wish to Retire from the Job? [Hebrew]. TheMarker [Online]. Available: http://www.themarker.com/markets/1.438038. Accessed 13 September 2013. Drucker, R. (2010, January). Document: The Deposition of Mordechai Gilat Against Yediot [Hebrew]. Raviv Drucker Blog [Online]. Available: http://israblog.nana10.co.il/blogread.asp?blog=394281&blogcode=11528529. Accessed 3 February 2012. Drucker, R. (2012, September). Don’t Get Confused—The ‘Bad Guy’ in the ‘Maariv’ Story Is Nochi Dankner (and His People) [Hebrew]. Raviv Drucker Blog [Online]. Available: http://drucker10.net/?m=201209. Accessed 5 January 2013. Dun and Bradstreet Israel Group. (2012). Dun’s 100—2007–2012. Available: http://www.dbisrael.co.il/english. Accessed 15 June 2014. Eglash, R. (2014, May 1). How U.S. Billionaire Sheldon Adelson Is Buying Up Israel’s Media. The Washington Post [Online]. Available: http://www.washingtonpost.com/blogs/worldviews/wp/2014/05/01/how-u-s-billionaire-sheldon-adelson-is-buying-up-israels-media/. Accessed 15 December 2014. Globes. (2011, March 31). The Senior Executives Salaries: The 20 Most Rewarded Executives [Hebrew]. Available: http://www.globes.co.il/news/article.aspx?did=1000628798. Accessed 12 July 2014. Globes. (2012, November 14). The Plaza Project: The End—Tshuva and Dankner Erased ILS 2.4 bn [Hebrew]. Available: http://www.globes.co.il/news/article.aspx?did=1000798382. Accessed 12 July 2014. Halutz, A. (2010, October 10). Who Arrived to Idan Ofer’s Birthday Party? [Hebrew]. TheMarker. Available: http://www.themarker.com/tv/1.589503. Accessed 2 December 2014. Horesh, H. (2010, June 9). The Myth of the Market Centralization Is a Product of Politicians [Hebrew]. Maariv. Available: http://www.nrg.co.il/online/1/ART2/117/921.html. Accessed 2 December 2014. Horesh, H. (2014, January 1). The Trillion Club: Forget the Decile or the Top 1%: Who are the People Who Really Manage the State [Hebrew]. Forbes. Available: http://www.forbes.co.il/news/new.aspx?Pn6VQ=E&0r9VQ=MDGM. Accessed 5 January 2014. Israel Knesset Research and Information Center (MMM). (2012). Description and Analysis of the Poverty and Inequality Dimensions in Israel and in Developed Countries [Hebrew]. Available: http://www.knesset.gov.il/mmm/data/pdf/m03095.pdf. Accessed 11 June 2014. Israel Ministry of Finance. (2012a). Committee 2010—The Committee on Increasing Competitiveness in the Economy—Final Recommendations and Completion of the intermediate Report [Hebrew]. Available: http://mof.gov.il/Committees/CompetitivenessCommittee/FinalReport_FinalRec.pdf. Accessed 14 June 2014. Israel Ministry of Finance. (2012b). The Committee to Increase Competition in the Market [Hebrew]. Available: http://mof.gov.il/Committees/PreviouslyCommittees/Pages/CompetitivenessCommittee.aspx. Accessed 12 June 2014. Israel Ministry of Finance and Ministry of Industry, Trade and Labor. (2011). The Plan to Encourage Investments by Institutional Investors in the Hi-Technology Industry [Hebrew]. Available: http://www.ag.mof.gov.il/NR/rdonlyres/1A223FD2-6F32-4807-BA65-AA41EF08BE83/0/mosdinshelot2.pdf. Accessed 2 May 2014. Israel Office of Chief Scientist. (2010). Plans to Support R&D in 2011–2012 [Hebrew]. Available: http://www.moital.gov.il/NR/rdonlyres/0BA7755A-4F76-4520-9A67-A4216C30E071/0/mopspreads.pdf. Accessed 3 May 2014. Jerusalem Magistrates Court. (28.02.2011). Likud vs. Kadima—Court Ruling [Hebrew]. Available: http://www.news1.co.il/uploadFiles/912273585796357.pdf. Accessed 4 May 2014. Knesset Research and Information Center (MMM), Agmon, T., & Tzadik, A. (2010). Business Groups in Israel—Description, Analysis and Implications—Updated [Hebrew]. Knesset MMM [Online]. Available: http://www.knesset.gov.il/mmm/data/pdf/m02523.pdf, 15 April 2013. Accessed 24 July 2014. Levin, E. (2003, September 25). The Labour Party and the Banks, Headed by Hapoalim, on the Verge of Agreement to Stretch Out Debts [Hebrew]. Globes. Available: http://www.globes.co.il/news/article.aspx?did=727046. Accessed 7 July 2013. Levs, J. (2008, November 10). Big Three Auto CEOs Flew Private Jets to Ask for Taxpayer Money. CNN. Avialiable: http://edition.cnn.com/2008/US/11/19/autos.ceo.jets/. Levy, R. (2012, December 30). The Ministry of Communications: The Public Saved ILS 5.7 Billion Following the Reform in the Cellular Market [Hebrew]. Calcalist. Available: http://www.tbk.co.il/article/2619714. Accessed 7 July 2013. Lipson, N. (2010, August 20). Daniel Wolfenzon: Powerful Families Wish to Be ‘The Only Game in Town’ [Hebrew]. TheMarker. Available: http://www.themarker.com/misc/1.586554. Accessed 26 March 2013. Makover-Belikov, S. (2013, April 5). Yuval Steinitz Reveals: I Was Afraid They Would Destroy Me [Hebrew]. Maariv. Available: http://www.nrg.co.il/online/1/ART2/457/784.html. Accessed 4 May 2014. MOITAL, Israel Office of Chief Scientist. (2010). Plans to Support R&D in 2011–2012 [Hebrew]. Available: http://www.moital.gov.il/NR/rdonlyres/0BA7755A-4F76-4520-9A67-A4216C30E071/0/mopspreads.pdf. Accessed 3 May 2014. Nissan, Y. (2012, December 12). Rani Rahav: No More Kahlons; This Is a Minister of Communications Who Brought the Firing of Hundreds of Employees, Collapse of Companies and the Rise of VAT in 1% [Hebrew]. Globes. Available: http://www.globes.co.il/news/article.aspx?did=1000808442. Accessed 4 March 2014. Noyman, E. (2009, June 12). The Business Groups Must Be Dismantled. Otherwise—Later It Will Be Impossible [Hebrew]. TheMarker. Available: http://www.themarker.com/markets/1.547127. Accessed 3 September 2013. OECD. (2013). Factbook 2013—Economic, Environmental and Social Statistics. Available: http://www.oecd-ilibrary.org/economics/oecd-factbook_18147364. Accessed 5 May 2014. Persico, O. (2013a, April 3). To Frighten [Hebrew]. The 7 Eye. Available: http://www.the7eye.org.il/57828. Accessed 16 March 2014. Persico, O. (2013b, July 2). A Thousand Sayings and Slogans [Hebrew]. The 7 Eye. Available: http://www.the7eye.org.il/69934. Accessed 16 March 2014. Plotzker, S. (2006, June 19). Too Few Nochi Dankners [Hebrew]. Yediot Aharonot. Available: http://www.ynet.co.il/articles/0,7340,L-3305634,00.html. Accessed 2 September 2013. Psika (Court Ruling Search Database). (2010, January 27). Mordechai Gilat Against Yedioth Ahronoth [Hebrew]. Available: http://www.psika.net/68951-323.html. Accessed 5 May 2014. Rachlevsky, S. (2014, May 14). Israel Hayom Is No Newspaper [Hebrew]. Haaretz. Available: http://www.haaretz.com/opinion/.premium-1.590493. Accessed 15 March 2015. Raz, H. (2012, November 2). Shlomo Nehama: ‘I tried to Intermediate between Dani and Shari—And Was Removed [Hebrew]. TheMarker. Available: http://www.themarker.com/markerweek/1.1855609. Accessed 25 September 2013. Rolnik, G. (2012, September 21). On the Corrupted Connection between Journalism and the Israeli Centralized Club [Hebrew]. TheMarker. Available: http://www.themarker.com/markerweek/thisweek/1.1828013. Accessed 15 March 2015. Sadeh, S. (2011, September 1). Capital-Politics-Newspaper: All the Centralization in One Wedding [Hebrew]. TheMarker. Available: http://www.themarker.com/personal/1.1219766. Accessed 3 May 2013. Salinas, S. (2012, November 11). The End of the Road of Dankner and Tshuva in Las Vegas—The Lenders Take the Ground [Hebrew]. Calcalist. Available: http://www.calcalist.co.il/markets/articles/0,7340,L-3587731,00.html. Accessed 15 March 2015. Sharoni, Y. (2009, September 9). The Market Leaders Celebrate with Rakefet Russak-Aminoach [Hebrew]. Maariv. Available: http://www.nrg.co.il/online/16/ART1/940/161.html. Accessed 15 May 2014. Sharoni, Y. (2010, October 13), The Concentration Slogan Is Good to Create a Buzz, but Is Refuted [Hebrew]. Maariv. Available: http://www.nrg.co.il/online/16/ART2/166/198.html. Accessed 15 May 2014. Sharoni, Y. (2012, May 3). Prof. Yishai Yafeh Advised the Committee to Increase Competitiveness in the Banking System [Hebrew]. Maariv. Available: http://www.nrg.co.il/online/16/ART2/363/875.html. Accessed 15 May 2014. Sharvit, A. (2002, May 23), Nochi Dankner Is Still the Head of the Credit Committee in Hapoalim Bank [Hebrew]. Haaretz. Available: http://www.haaretz.co.il/misc/1.796343. Accessed 12 September 2014. Shpurer, S. (2010, March 12). The Common Path of the Cousins Dankner: From Purchasing Hapoalim Bank till Dani Dankner’s Problems [Hebrew]. Haaretz. Available: http://www.themarker.com/markets/1.566439. Accessed 12 March 2013. Shpurer, S. (2012, February 17). Private Banker [Hebrew]. Haaretz. Available: http://www.haaretz.co.il/magazine/1.1643580. Accessed 12 March 2013. The State Comptroller of Israel. (2012). The 2012 Committee to Examine Crony Capitalism, Appointed by the State Comptroller of Israel in 2010 [Hebrew]. Available: http://progdemocracy.files.wordpress.com/2012/07/d793d795d797-d7a1d795d7a4d799-d795d79ed795d793d7a4d7a1-d7a9d79c-d794d795d795d7a2d793d794-d799d795d7a0d799-2012.pdf. Accessed 14 June 2014. The World Federation of Moroccan Jewry. (2009, May 19). Nochi Dankner? A Model of the Jewry. Available: http://www.fede-maroc.org/189578/%D7%A0%D7%95%D7%97%D7%99-%D7%93%D7%A0%D7%A7%D7%A0%D7%A8-%D7%93%D7%9E%D7%95%D7%AA-%D7%9E%D7%95%D7%A4%D7%AA-%D7%91%D7%A2%D7%9D-%D7%94%D7%99%D7%94%D7%95%D7%93%D7%99-2009. Accessed 5 October 2014. Weitz, G., & Gabison, Y. (2013, July 25). The Party of Dani, Shari and Zion. This Is How Hapoalim Bank Distributed Credit to Cronies [Hebrew]. Haaretz. Available: http://www.haaretz.co.il/magazine/1.2080967. Accessed 27 July 2014. Zarchia, Z. (2003, August 31). Hapoalim Bank Will Stretch Out the Debt of the Labour Party [Hebrew]. Haaretz. Available: http://www.haaretz.co.il/misc/1.907070. Accessed 5 May 2013. Zarchia, Z. (2010, June 23). Who Is Yulia Shamalov-Berkovich, the MK Who Met Ilan Ben-Dov and Objects the Reform in the Cellular Market? [Hebrew]. TheMarker. Available: http://www.themarker.com/technation/1.572922. Accessed 3 June 2014.